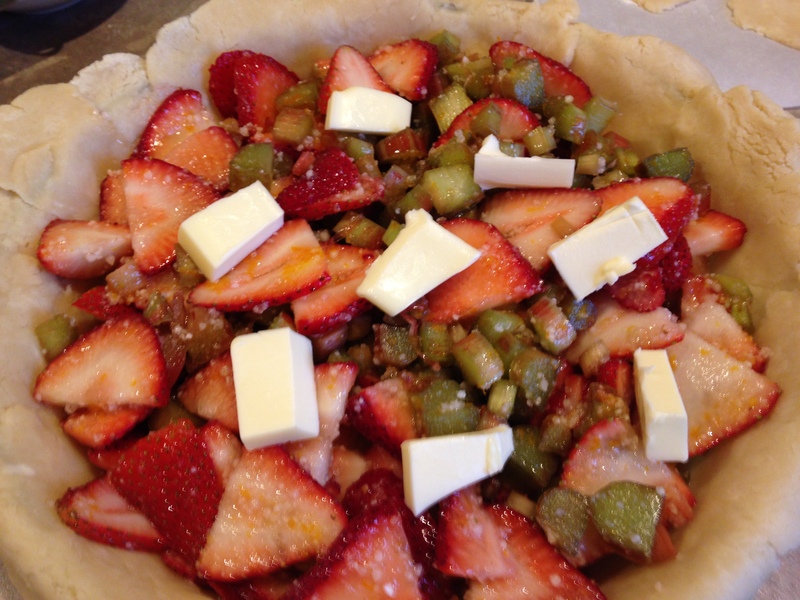 Strawberries and Rhubarb are in season. Must have been on Martin2’s mind. He challenged me to another pie. The last one I made for him was a Pumpkin Pie at Thanksgiving. It was ok. I am not a pie person. I guess the more I make the better I will get, right? 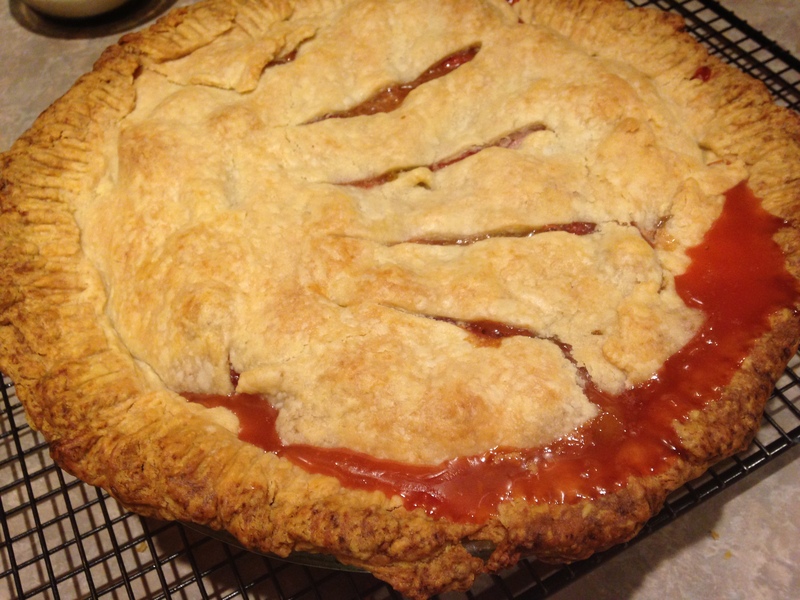 He requested a Strawberry Rhubarb Pie for this weekend. When I was talking with him earlier today he also mentioned coffee cake. Well, I baked the pie and then for back up I made a Cinnamon Streusel Coffee Cake. If he likes them both then that is a bonus!! Actually the pie looks and smells quite delicious. I don’t want to try it until he does first. I sent the Martin’s a pic of the pie and cake. That prompted a visit. They both loved the pie and the coffee cake. I found the recipe for the pie, where else – America’s Test Kitchen. 4. Roll larger dough disk on lightly floured surface into 12-inch circle, about 1/8-inch thick. (I rolled out on parchment paper. That made it easier to transfer to the pie plate.) Transfer and fit dough into 9-inch Pyrex pie pan, leaving dough that overhangs the lip in place. 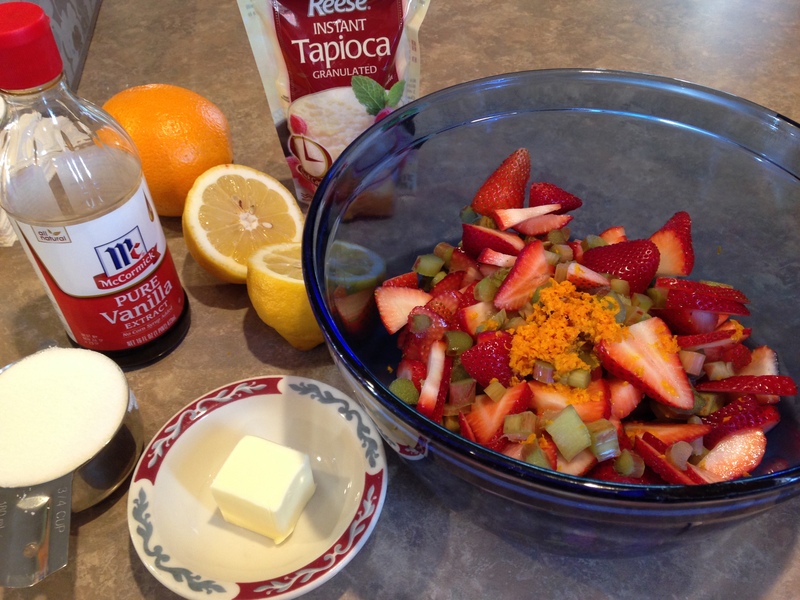 Turn fruit mixture, including juices, into pie shell. Scatter butter pieces over fruit. Refrigerate until ready to top with remaining dough. 6.Place pie on baking sheet; bake until top crust is golden, 20 to 25 minutes. Reduce oven temperature to 350 degrees and continue to bake until juices bubble and crust is golden brown, 30 to 40 minutes longer. This was very simple and delicious. This pie takes no time at all and you will love it. Enjoy!! May 2014 update; Baked this cake tonight. 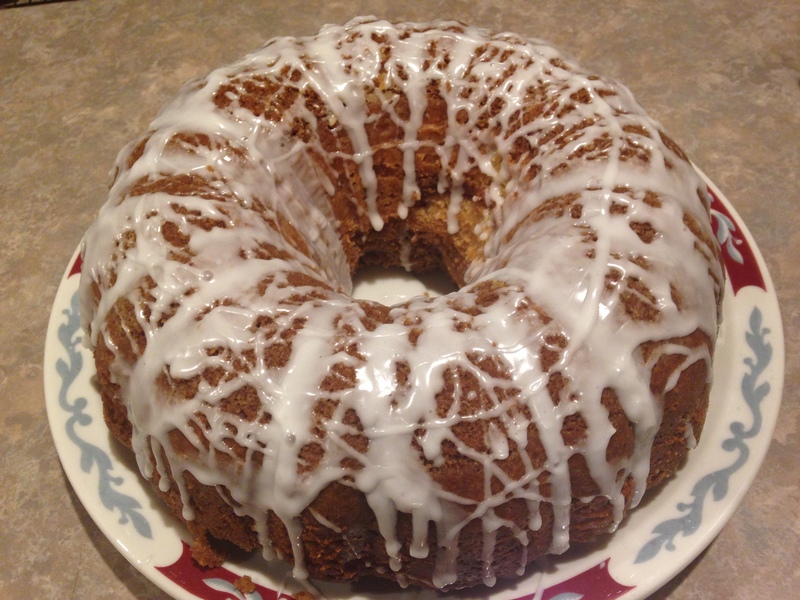 I popped over at the Martin’s this morning and Martin2 mentioned coffee cake. That got me thinking about how much I love coffee cake. Had to make it for tomorrow morning to enjoy with a nice, strong cup of coffee!! Martin requested glaze so I topped it with that this time around. I couldn’t wait for tomorrow so I tried a piece tonight. This was simple and incredible DELICIOUS! With or Without Glaze. It is delicious either way!! Whisk above ingredients together. It is that simple! 3. Spoon 1/2 of the streusel topping into greased and floured 12 cup bundt pan. Spoon 1/2 of the batter over top. Repeat layers ending with streusel on top. When I first made this cake in January 2012 I checked with Eric and Rachel to see if I should add a glaze or sugar on top. We agreed to leave it just as it came out of the oven. They both loved this cake and will definitely be happy to see I have made it again when they come over tomorrow for dinner. 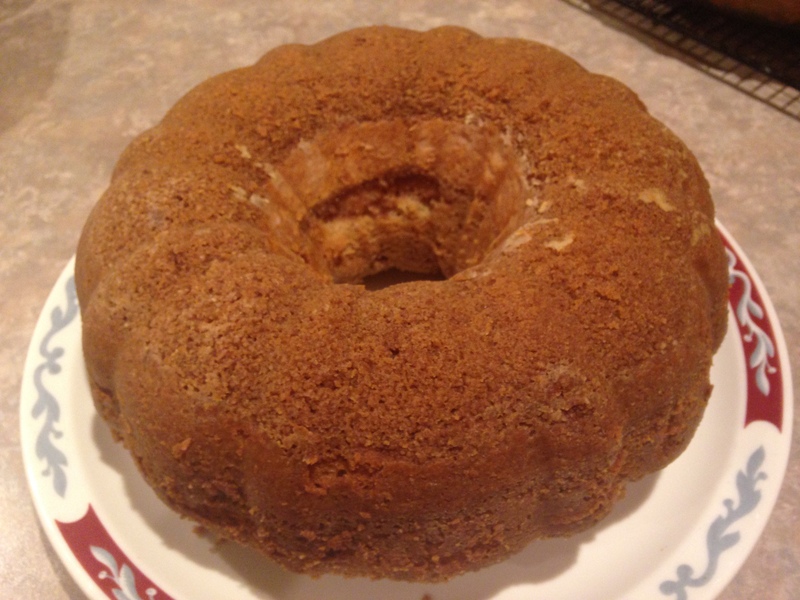 This bundt cake really was Simple and very Delicious! Spinach Salad with all kinds of delicious ingredients!! Martin and I drove to Syracuse this weekend. We decided last year to start taking annual road trips. Syracuse has been the destination the last 2 years. 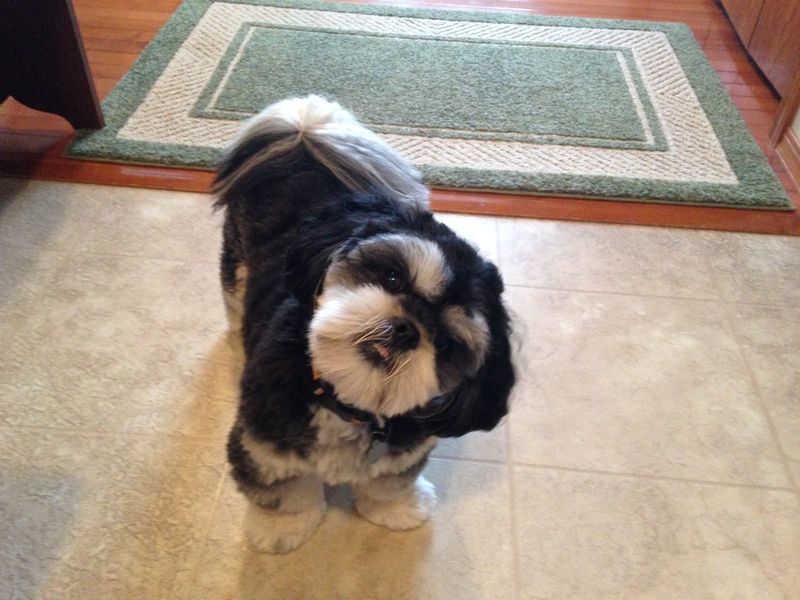 We like to chat for our 15 hour drive – one way! 🙂 When I get there I can spend time with my parents. He joins me or hangs with some friends he has made there. 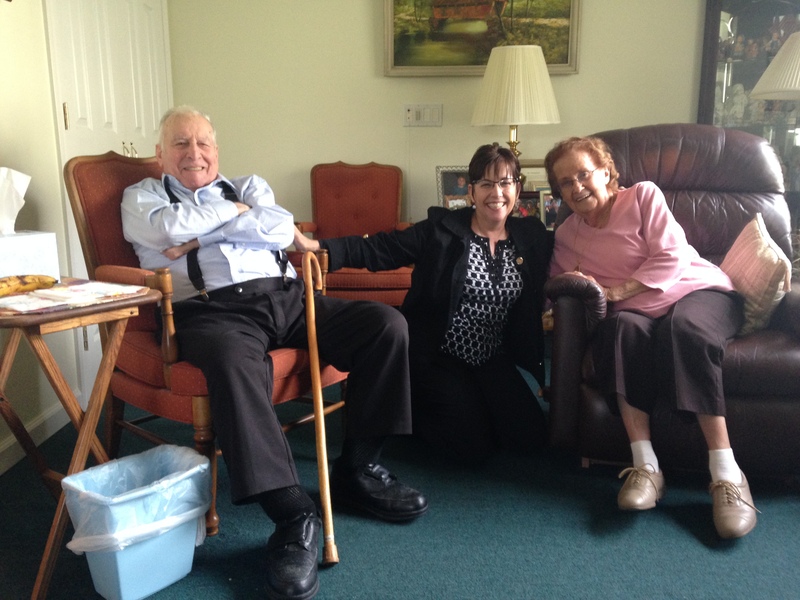 My mom and dad live at an assisted living facility. My mom is not a fan of the food there. This visit I asked if she would like me to make something for her. She requested Coconut Macaroons. She also mentioned stuffed peppers. I ended up making dinner on Saturday evening at Tony’s home. The menu I thought she would enjoy was Grilled Poblano Peppers, Spinach Salad and Strawberry Parfait. (I did bring macaroons but gave those to her when I arrived.) We had a very nice time and I enjoyed being able to have a chance to make my parents a simple and delicious meal. Talk about simple – the salad was just that!! Place ingredients for the dressing in a bowl and whisk. ( I put in a small mason jar and shook the ingredients together.) Mix with spinach, strawberries, brussels sprouts and asparagus. You will LOVE this salad. Give it a try! I am in the Mexican food mood lately. I really enjoy the flavors of cumin and hot peppers or sauces. I am also enjoying cilantro. I never thought I would say that! Cilantro does add a nice flavor with certain dishes and this was one of them. I got this recipe from America’s Test Kitchen. I changed the recipe up a little bit. Next time I will have to add a little jalapeno pepper. 😉 I made this on Mother’s Day. As usual, I had open dinner for Sunday. Lily, Eric, no Rachel she had to work, Martin and Martin2 who actually got out of work early and was able to pop over. Martin2 definitely was a fan of this salad. Here is the recipe for all to enjoy! 1. Puree lemon and lime juices, garlic, chili powder, cumin, 1 teaspoon salt, and red pepper flakes in blender or food processor until smooth. Turn blender back on and add oil in steady stream until incorporated. 2. 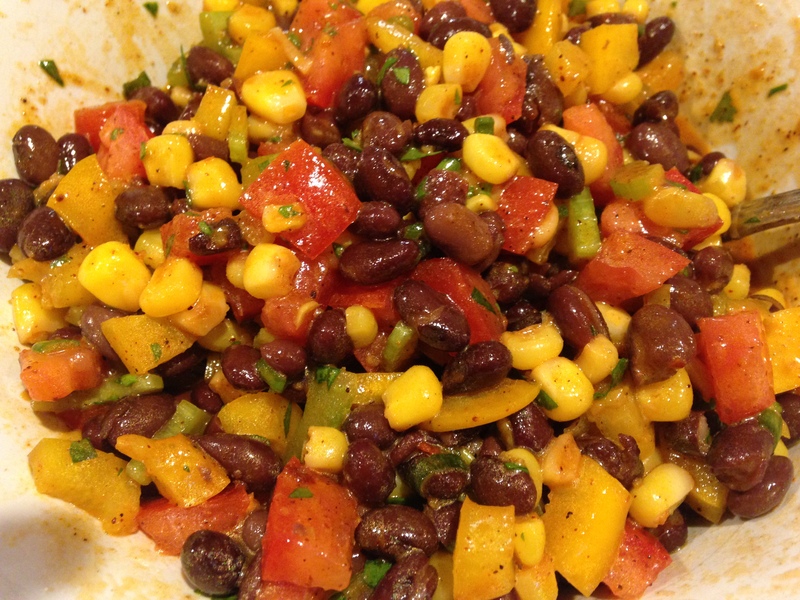 Place corn, beans, bell pepper, celery, green onions, and cilantro in serving bowl. Pour dressing over salad and toss well to combine. Cover and refrigerate for at least 2 hours or overnight. 3. Just before serving, stir in tomatoes. Season with salt to taste. Simple and Delicious!! Mondays are a very busy day at work. When I get home I want to make a quick meal. I went to Costco over the weekend and bought a 2 pound bag of asparagus. 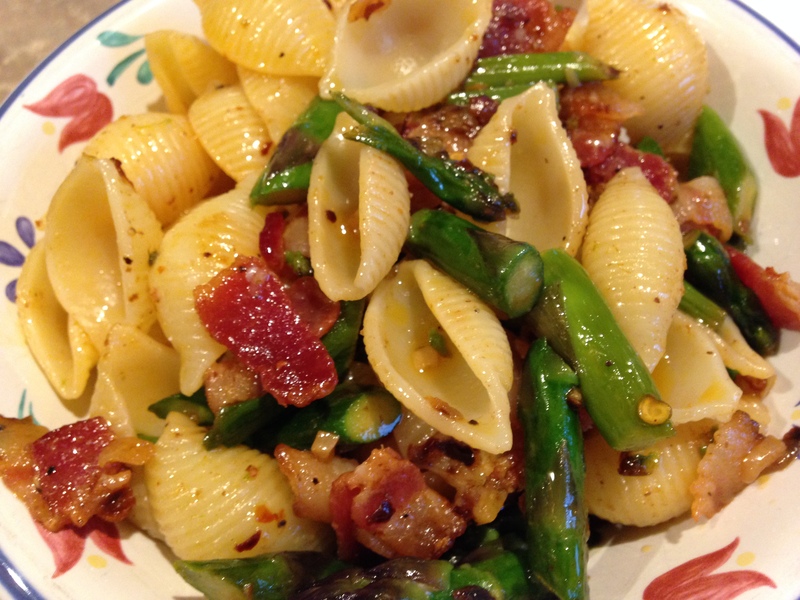 I decided that asparagus and pasta sounded like a quick and easy meal. If you like heat and flavor, then you will enjoy this meal. 1. Bring 4 quarts of water and 1 Tablespoon salt to a boil. Add pasta and time for 6-8 minutes. Depends on how you like your pasta. I like it al dente. 3. Add 1/4 cup of olive oil to frying pan. Let heat until shimmering. 4. Add garlic, crushed red pepper and your hot sauce. Cook for 2-3 minutes. 5. Add asparagus and saute for 5-8 minutes. This will heat through and still keep the beautiful green color. Don’t overcook. 6. Mix in Parmesan cheese. 7. Drain your pasta. 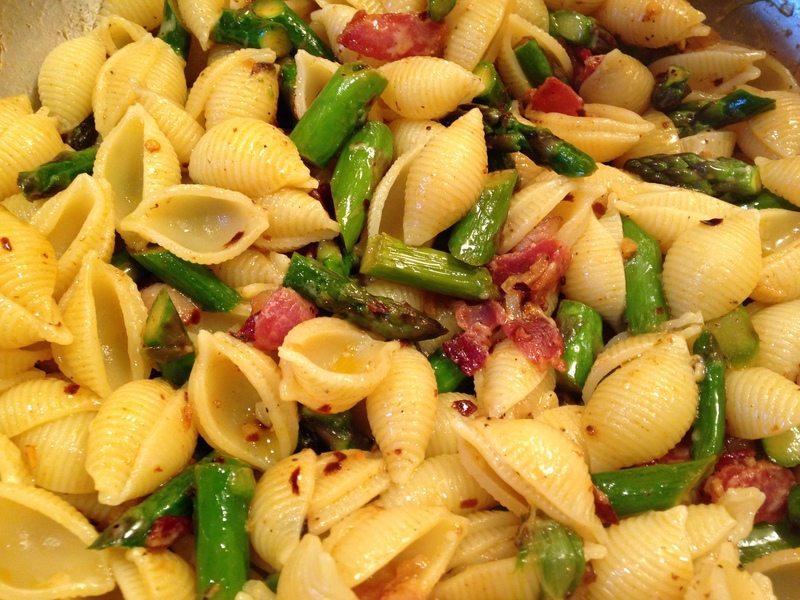 Add pasta to the skillet and stir into the asparagus mix. 8. Enjoy your bowl of pasta with a touch of heat!! Our office had a food day for Cinco de Mayo. Of course with a Mexican theme. I thought a nice soup would be enjoyed by all. I found this recipe on old faithful, America’s Test Kitchen. I had Kent taste test before I brought it in and he thought it was tasty. I believe most everyone liked it at work. Personally, I think it could have used a little more heat. Next time I will add a whole jalapeno, cayenne and a dash of cumin. This was a Simple and Delicious recipe! 1. Bring 4 cups broth, chicken, 2 onion quarters, 2 garlic cloves, cilantro, and 1/2 teaspoon salt to boil in large skillet over high heat. Cover and cook over low heat until chicken is cooked through, 8-10 minutes. Transfer chicken to a large plate. 3. Heat oil in Dutch oven over high heat until shimmering. Add tomato mixture and 1/8 teaspoon salt and cook until darkened in color, 8 to 10 minutes. Strain broth directly into post with tomato puree (discard solids). Add remaining 2 cups broth, reserved tomato juice, corn and beans and simmer to blend flavors, about 5 minutes. Shred or dice chicken into bite sized pieces and add to soup. Stir in lime juice and season with salt and pepper. You could garnish with an avocado, Monterey Jack cheese and cilantro. That’s it! Another dish under an hour to make. 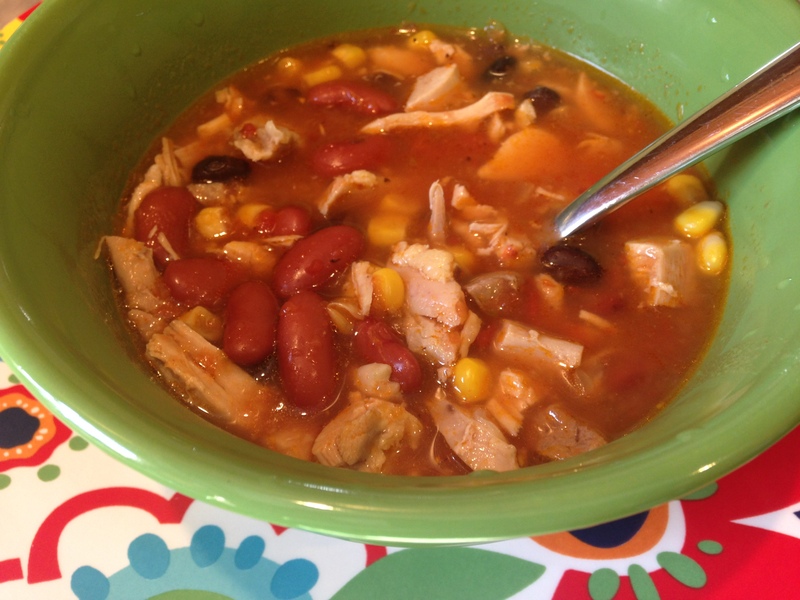 Hope you enjoy this simple and delicious soup!! A great suggestion I received from my friend, Jill. This took under an hour from start to finish. I love simple and delicious weeknight meals. I doubled the meat filling recipe. I used 16 ounces for the pie filling and froze the rest for tacos for another day of the week. This photo doesn’t show everything I used. 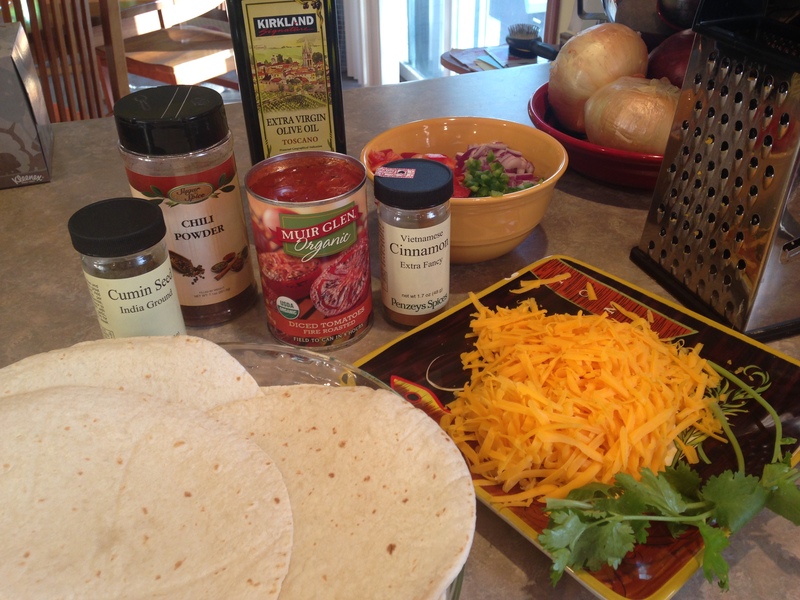 I started with the original recipe and added a couple more ingredients as I went on! Oops!! 2. Brush a 9 inch pie plate with olive oil. Spread a large spoonful of diced tomatoes on the bottom of the pie plate. 3. Arrange four of the tortillas on top of the tomatoes and up the sides of the plate, overlapping as necessary, set aside. 4. 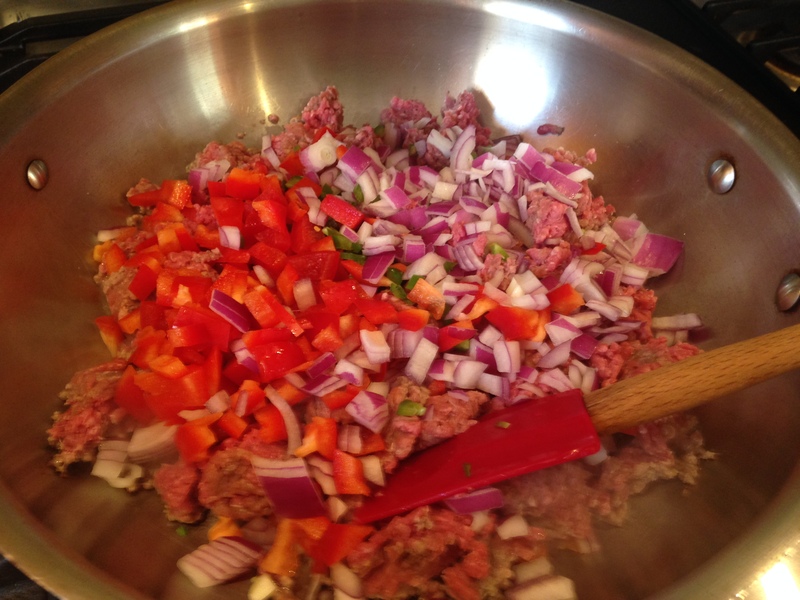 In a large skillet cook ground beef, onion, red pepper, jalapeno pepper and garlic on medium high heat until browned; drain off fat. Add chili powder, cumin, cayenne pepper, ground pepper and cinnamon, cook and stir through. 5. Stir in about 1/2 of the remaining diced tomatoes. Bring to boiling; reduce heat and cook uncovered about 2 more minutes. 6. Spoon over tortillas in place. Cut remaining 2 tortillas into strips. Layer cheese and tortilla strips over beef mixture. Top with remaining diced tomatoes. 7. 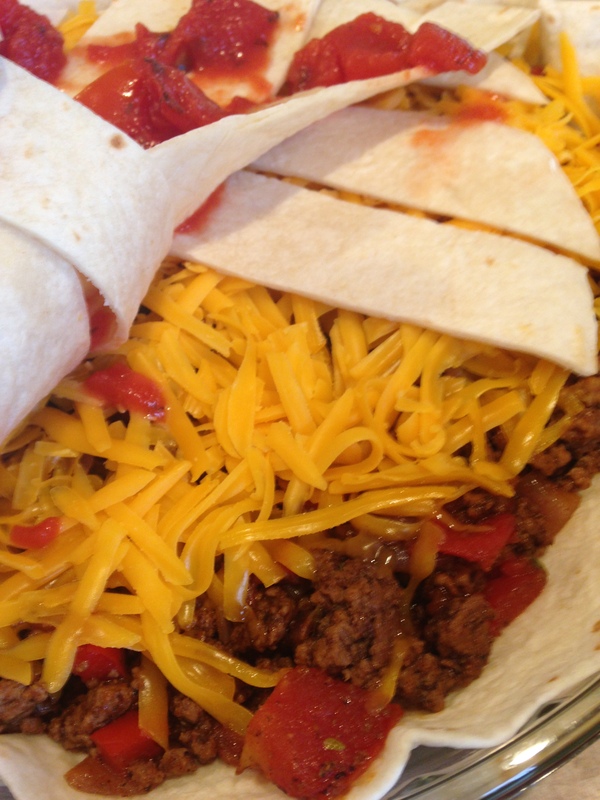 Bake, uncovered for 20-25 minutes or until tortillas are lightly browned. 8. Let stand for 5 minutes. Cut into wedges and serve. Top with cilantro if you desire. 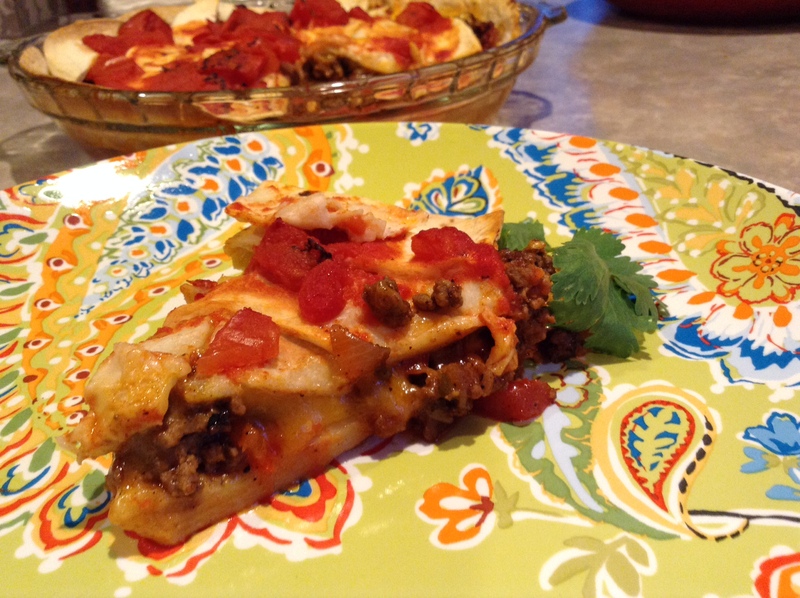 We loved this taco pie. Lily noticed a bit of a sweet flavor to it. That was the cinnamon. Kent and I thought it was a nice flavor. If I were you I would try it with the cinnamon. You can always take it out next time. 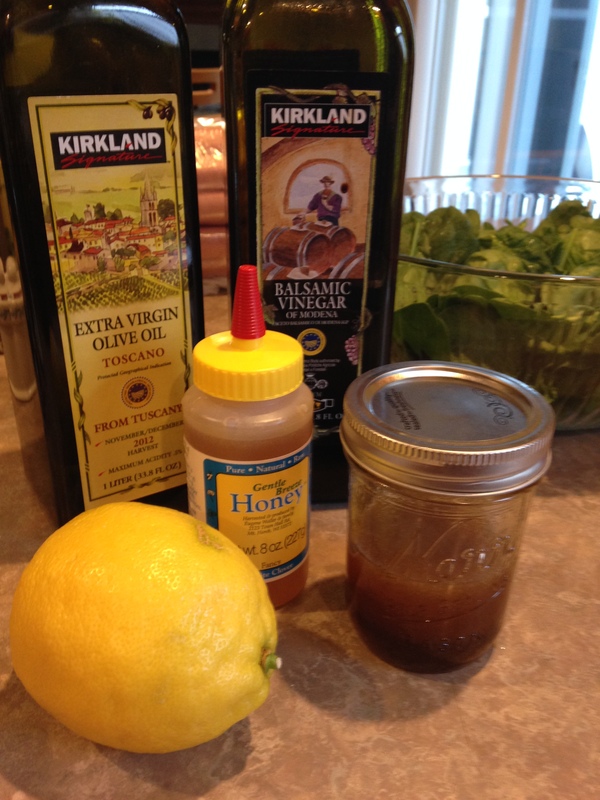 Try this simple and delicious recipe and let me know what you think!! I wanted to do a Mexican Sunday dinner this weekend. Since Martin II works weekends he rarely is able to come to dinner on Friday or Sunday. I asked if there was anything he wanted me to make. 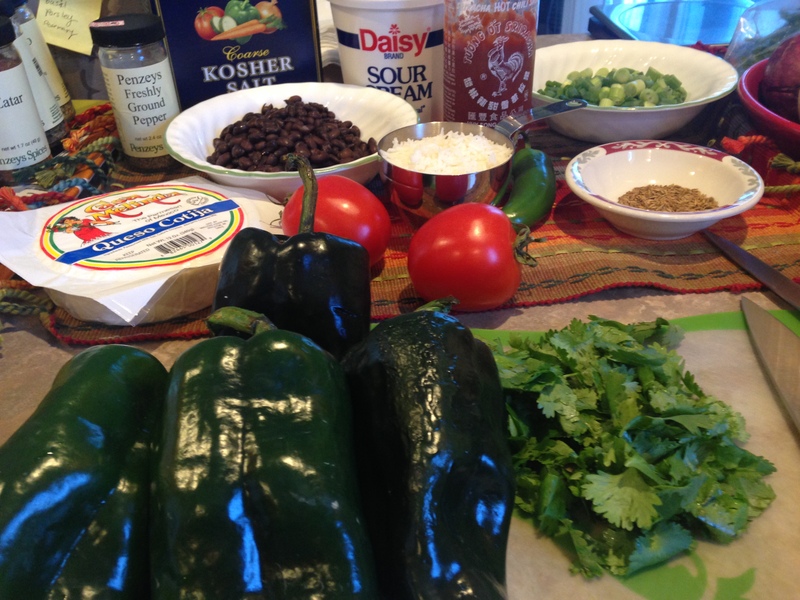 He asked if I would make one of his favorite restaurant dishes this weekend; Stuffed Poblano Peppers. I accepted this challenge and decided on a meatless stuffed pepper. He was able to come over for lunch and he loved these peppers. That made me very happy. Hope you enjoy them as much as we did!! 1. Using a paring knife to cut a wide circle around each stem, so you end up with a cap that can be replaced once you stuff the peppers. (Keep in mind, you are going to be grilling the peppers.) Remove and discard any seeds and membranes from the cap and from the interior, set the peppers aside. 2. Place the black beans in a large bowl. Using the back of a fork, mash the beans. Some whole beans should remain. 3. Add the rest of ingredients. Gently mix in the cooled rice. I would taste to be sure it is seasoned enough with salt and pepper. The Cotija cheese is kind of salty (like a feta cheese) so you want to be sure you taste before adding too much salt. 5. Heat grill to medium (350-450 degrees). Place the stuffed peppers on their sides and cover the grill. (I put a piece of aluminum foil on the grill. I set the tops of the peppers on the foil. This way if any filling leaked out, it did so on the foil. This worked really well for me.) Grill, rolling each pepper a quarter turn every 7 minutes to cook all four sides. The skins of the peppers are well charred. it does take about 30 minutes to grill the peppers. Remove the toothpicks and serve. I was concerned about grilling but they turned out great! Kent and I thought they were delicious and Martin II absolutely loved them. 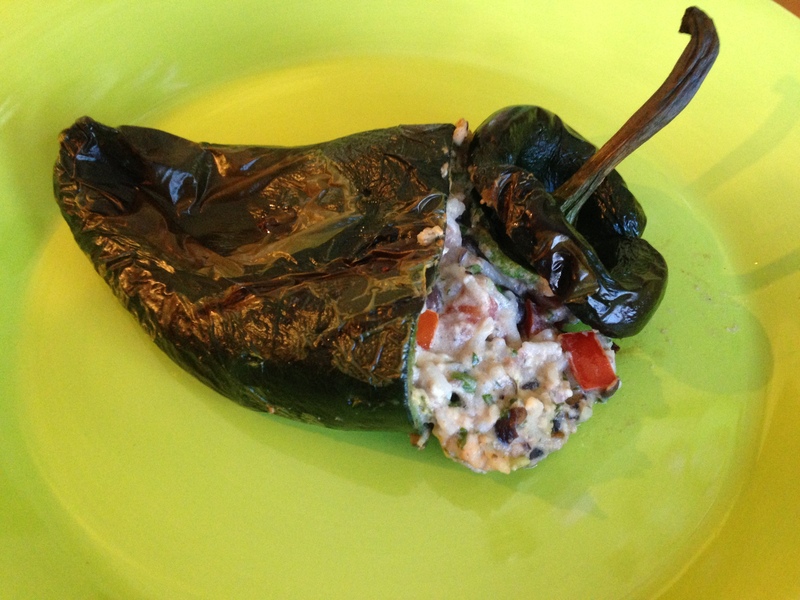 He said these were the best stuffed Poblano peppers he ever had. That works for me!